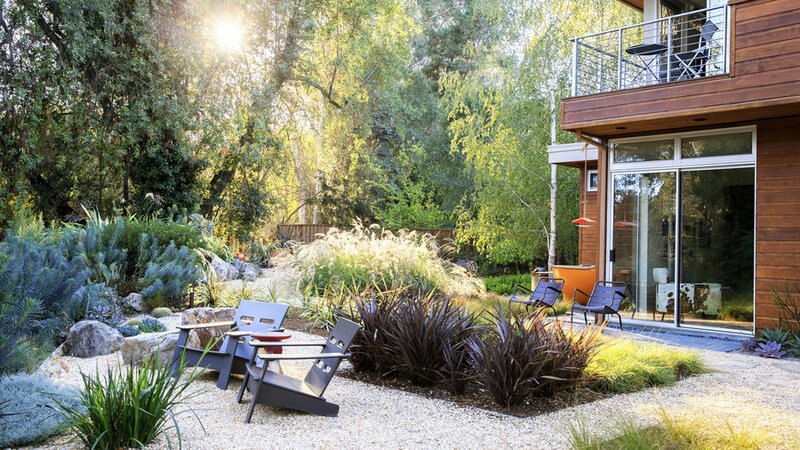 The 7,342-square-foot garden runs along the San Francisquito Creek on a diagonal. The main deck is just outside the family’s living room, with a path leading to a more open gathering area around the corner. underneath. 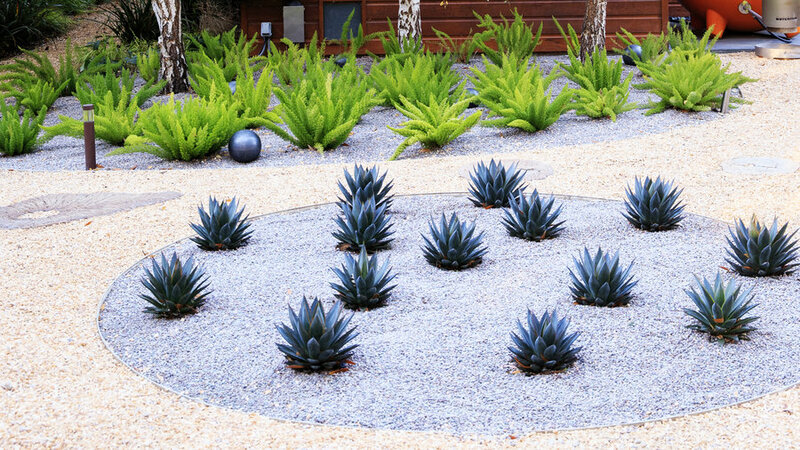 Agaves (Agave ‘Blue Glow’) in the circular bed are widely spaced to allow for growth and show off their structural shapes. Montego sofa, chair, and cocktail table, roomandboard.com. 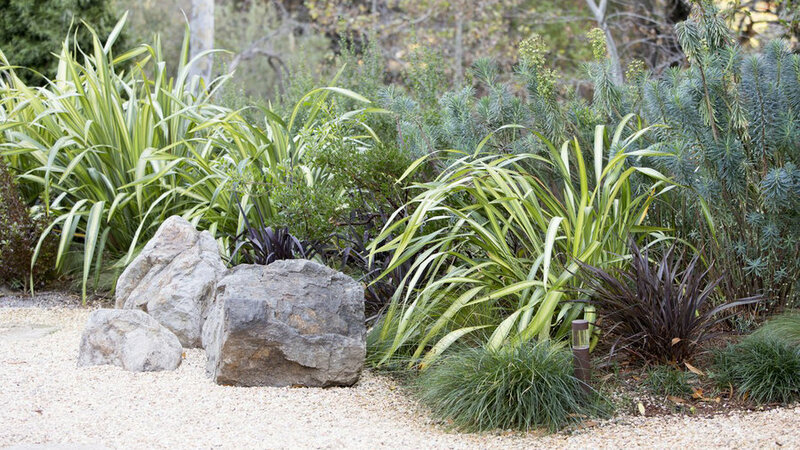 At the outer edge of the yard, Willig blurred the line between the garden and riparian habitat using a range of water-wise perennials and ornamental grasses. These include tall blue-green Euphorbia characias wulfenii (in back); green and yellow variegated Phormium ‘Yellow Wave’ (creating a fountainlike effect in the middle); and compact bronze P. ‘Jack Spratt’ and Carex tumulicola, which forms mounded blue-green tufts at the bed’s edge. “I’ve yet to turn on my sprinkler system this year,” says Zwiers. 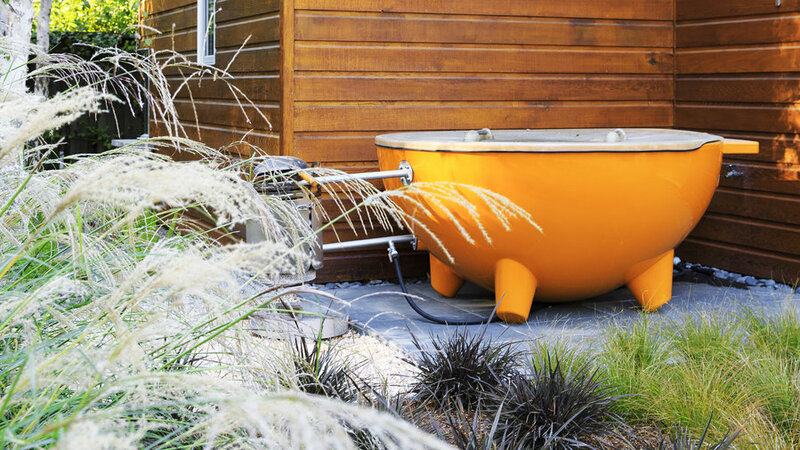 A wood-fired portable hot tub is tucked into a nook in the corner of the garden outside the couple’s bedroom. “We can almost step into it right from our room,” says Zwiers. Dutch Tub, weltevree.nl for stores. A wide path filled with taffy gravel winds around the beds, dotted with concrete pavers that look like cross sections of eucalyptus logs (from San Francisco’s Flora Grubb Gardens). Tightly packed rosettes of Echeveria ‘Afterglow’ and Mexican beach pebbles fill a rectangular bed. 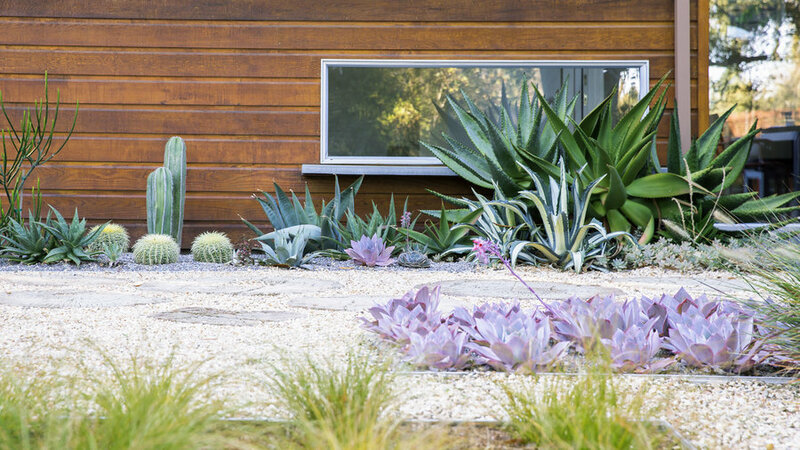 Succulents and cactus stand out against the home’s cedar siding. 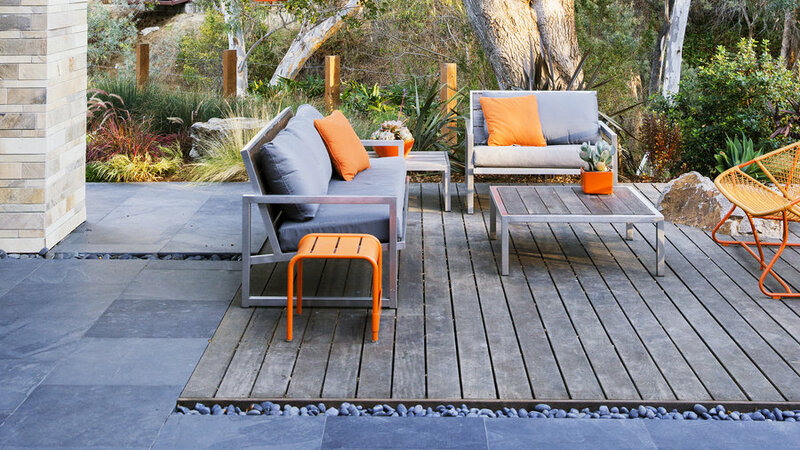 A mix of casual seating surrounds an in-ground firepit in the most secluded part of the garden. Situated under the canopy of an existing eucalyptus, it's the perfect place to enjoy some piece, listen to bird calls, and, at night, roast s'mores. 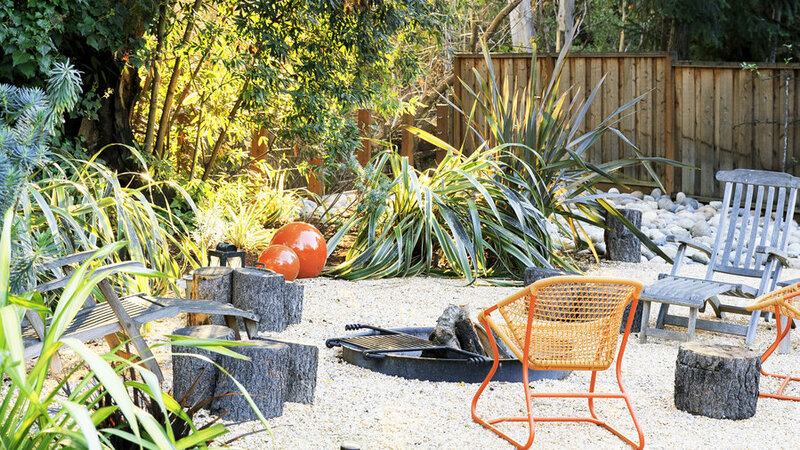 Fermob's orange Sixties chairs add a playful touch, echoed by the decorative ceramic globes nestled together in the planting bed. Grouped together, wooden stumps are sculptural when not in use and double as stools or beer-rests for gatherings. Unifying the wood, a lounge chair awaits anyone looking for relaxation.